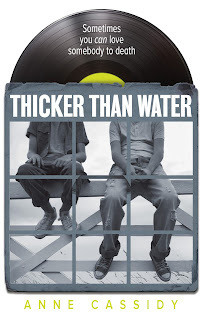 Anne Cassidy, the author of the brilliant Looking for JJ and Finding Jennifer Jones, approaches her latest novel, Thicker Than Water, with the same intensity. A modern take on John Steinbeck’s Of Mice and Men, the storyline retains the question, how far would you go to protect someone you love? George and Lennie dream of running their own record store, equipped with purchases of vinyl records from Op Shops and on-line. To this end, they arrive at the Old Ship Inn to start work and save their money; George as DJ and at the bar, and Lennie doing odd jobs. Before they go to the Inn, George points out to Lennie a safe haven in case of trouble. George again is Lennie’s protector. There’s no shortage of challenges connected to suspect actions by the pub’s owner Billy, his son Boxer and his beautiful wife, and Danny, another employee. These interesting characters are added to enough mystery to keep the reader involved. Having read and adored the original story, I could anticipate each scene. For those who haven’t yet read the original, this will be a journey into themes of sacrifice, the many sides of love, and the choices that we make depending on our need, conscience, loyalty and sense of duty.